Unity editor extension to generate shaders from template files. uShaderTemplate is an editor asset to create shader from templates. Download the latest .unitypackage from Releases page, then import it. Create Generator from Create > Shader > uShaderTemplate > Generator. 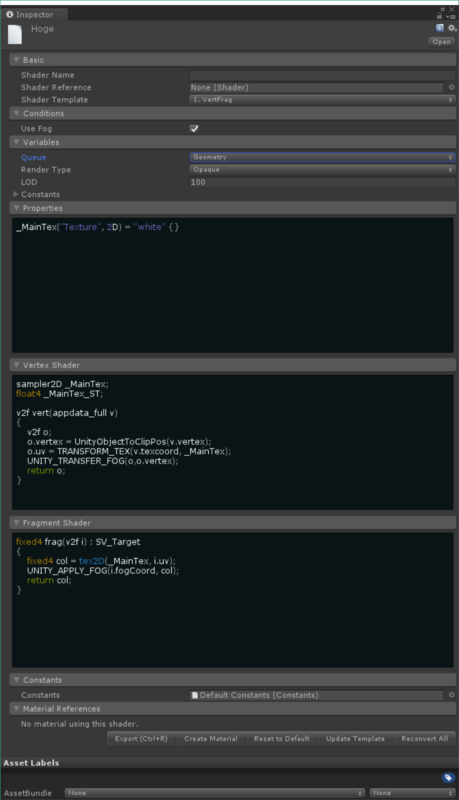 Input Shader Name and select Shader Template from the inspector. Edit items in Conditions, Variables, and codes in code editors. Press Export (Ctrl+R) button to create a shader from the Generator. Generator is an asset file that manages a generated shader, save parameters, and provide an interface to customize the shader with some rules written in shader template. The following image is an example of a Generator inspector which is automatically generated from shader template. You might have found some grammars like @if foo, <Bar>, @block baz, and these are special grammmars available in template file. Shader variant like #pragma multi_compile and #pragma shader_feature cannot customize the section outside CGPROGRAM, but with these grammar, you can customize the all parts of the shader. If you put template files like this in Resources > ShaderTemplates, they are automatically detected and shown in the Shader Template field in Basic section. //   A toggle filed labeled "Hoge Hoge" will appear in Conditions section. //   Only when checked, the content will be output. // You can use else block and give a default condition. //   The name with <> will appear in Variables section as a text field. //   You can give a default value with =, and =| will be pull-down list. //    The content will be a code editor. //    the result will be applied to the code editor in inspector. Export shader from Generator. You can use Ctrl + R as a shortcut key instead of pressing this button. Create material from the generated shader. Reset all parameters to the default parameters written in template. If you edit the template file, please press this before the export. Convert all generated shaders forcedly. This is useful when you edit template file and want to apply the change to all shaders. Instead of inputting variables in each inspector, you can use Constants asset as a shared variables among multiple Generators. Select Create > Shader > uShaderTemplate > Constants and add Name and Value pair to Values field of the created Constants asset. Then, drag and drop it to the Constants field of Generators which you want to apply the parameters to. Please remember that if you modify a parameter in Constants, you have to Reconvert All to apply the change to all generated shaders. In a shader template, you can specify the default Constants using @constants line if you want it. // you can insert this line anywhere in the template file. Generator and Constants have virtual functions, OnBeforeConvert() and OnAfterConvert(). You can create custom Generator and Constants inherited from these classes and override them to add callbacks just before and after convert.